“Four hundred years ago a baby went to sleep”: Restoring the past and recovering identity in Lucy Boston’s Green Knowe novels. This thesis will argue that Boston’s use of time, place and the pastoral form in her Green Knowe series establishes a strong sense that individual identity and belonging is significantly shaped by a sense of continuity with the past – a sense of oneself as a link in a temporal chain of family, events and landscape – and furthermore, that this feeling of ‘owning’ the past as valuable heritage is necessary to an individual’s security and confidence in their sense of self and belonging. Through an analysis of the six Green Knowe novels, this thesis will develop a coherent picture of the significance of the use of ‘Global Time’, presentation of the Green Knowe manor, and reworking of the pastoral form (both ironic and romantic) in these texts. While previous studies of the Green Knowe books have examined each of these three themes (time, place, and the pastoral) in isolation (see, eg. Cameron (1969), Buckalew (1994), Stott (1983)), and sometimes made the move to study the relationship to identity and belonging, there has been no extended study that links all three treatments under a common thesis. This thesis is significant in that it will make these connections in relation to the texts’ emphasis on the role of the past in shaping our identities. After exploring and narrowing what I mean by identity, sense of self, and belonging in this context, I will firstly contend that Boston’s use of Global Time – all times present and accessible in one moment – establishes a way to recover an individual's continuity with their past, restoring a security of identity threatened by unknown or severed links with their sense of heritage. Secondly, I will propose that Boston's depiction of the Green Knowe manor works both as a physical receptacle and symbolic representation of the past, while also providing a 'place' for Boston’s 'dis-placed' child characters to belong to. Finally, I will argue that while the Green Knowe series appears to follow the conventions of pastoralism, it is in the end a significant reworking of this tradition. By allowing, at the end of the six book series, the manor to have survived all threats to its existence, I will argue that the texts do not conclude with an ironic destruction of the pastoral world, and neither with the romantic reassurance that it will always remain. Rather, I will demonstrate, the texts suggest that a deep experience of the pastoral world allows the individual sense of belonging and identity to survive the inevitable eventual destruction of the physical pastoral world in which they were developed. Overall, I will demonstrate how the mingling of past and present, the notion that place can evoke a sense of belonging for those in need, and the preservation of the pastoral state within the scope of the narrative all move towards a reinstatement of the past as valued heritage in order to give continuity, a sense of belonging, and a sense of identity back to individuals threatened by the devaluing and destruction of their links to and sense of the past. Lucy Boston’s six novel series, comprise of (in chronological order): The Children of Green Knowe, The Chimneys of Green Knowe, The River at Green Knowe, The Stranger at Green Knowe, An Enemy at Green Knowe, The Stones of Green Knowe. These will be the most important primary texts as they form the main textual focus of my thesis. However, not every book is relevant to each of the three themes I will be examining. Children, Chimneys and Stones will be most important to my examination of time, Children, and Stranger to my investigation of place, and Stranger, Enemy and Stones to my examination of the pastoral. River, generally acknowledged as the ‘square peg’ of the series, will be of occasional relevance only. Central to my investigation of time in the Green Knowe novels will be Eleanor Cameron’s book The Green and Burning Tree, and Mary Buckalew’s article “Global Time in Lucy Boston’s Green Knowe Novellas”, which are the most detailed treatments to date of the use of time in the Green Knowe series, although in no way interchangeable in outlook. Buckalew explores Global Time (her term which I will appropriate for my writing) as time as ‘God’ beholds it – that is, time looked at from the perspective of Eternity. Her detailed exploration of the symbolism of Global Time in the books will be indispensable, she does not, however, link it as I will to development of a sense identity and belonging in the characters. Cameron’s book (the relevant chapter of which provides the title of the book itself), is an investigation of the mingling of the past and present – what she terms ‘the green and burning tree’ - in children’s fantasy. This classic study, much praised and disputed by later critics, is especially interesting as it does to link the use of time to the development of a sense of belonging (though she does not link it to identity) in the characters of Boston’s novels. 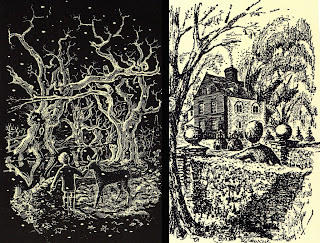 Although nearly every piece of writing on Lucy Boston explores to some extent the presence of the Green Knowe manor in her books, Lynne Rosenthal’s “The Development of Consciousness in Lucy Boston’s The Children of Green Knowe” will especially inform my study of the relationship between the Green Knowe manor and the development of sense of self of the texts’ characters. Although I find her psychoanalytic perspective rather forced upon the books, she does provide a useful and rare investigation into the need to ‘own’ one’s heritage in order to develop a fully rounded identity. Linda Hall’s “The Pattern of Dead and Living: Lucy Boston and the Necessity of Continuity” will also be useful to my study of the manor. Hall’s reading of the manor as a response to post World War II disregard for antiquity will help me to situate temporally the context of the texts’ preoccupation with maintaining the past in regards to maintaining the self. Also useful is “A message from Green Knowe”, Boston’s own article about the Green Knowe manor, and its real life counterpart where she lived at Hemingford Grey. A more contentious area of secondary literature concerns whether the Green Knowe series is an example of the pastoral form. Maria Nikolajeva’s book From Mythic to Linear: Time in children’s literature provides, with its examination of some general features of both romantic and ironic versions of the pastoral, an excellent basis for my definition of the literary form. Long-time commentator Peter Hollindale’s essay “Timescape at Hemingford Grey: Lucy Boston’s Centenary” argues that the series has a pessimistic trajectory (and as such could fit into the ironic pastoral form), and in her aforementioned article Lynne Rosenthal declares that – regardless of the series’ conclusion - the world of Green Knowe is not pastoral at all. I will disagree with both viewpoints, and argue that, in line with Jon Stott’s essay “From Here to Eternity: Aspects of the Pastoral in the Green Knowe Series” that the world of Green Knowe is a pastoral one, but one which rewrites the tradition into a positive progression that is certainly not ironic, but neither is it romantic. I will draw from Stott my notion that a deep experience of the pastoral world ensures an individual will always remain a part of it, but move beyond his article to suggest that this in turn implies that the sense of identity and belonging individuals develop there will also remain. My thesis will primarily use the approach of literary textual analysis, under the three thematic divisions of time, place and pastoral form. Adopting this thematic approach will be the most suitable way of structuring my thesis, as not every novel relates to all three themes - a text by text analysis would be inappropriate, and also unwieldy due to the number of books involved. Focusing on these three themes will also allow me to relate each one as I go with my overall contention that the Green Knowe books suggest a need to restore the past, to ‘own’ it as heritage and in doing so develop and ensure individual identity and belonging threatened by destruction of the past in both its physical and remembered forms. - pastoral form: a pattern of narrative where a character enters and becomes part of an ideal place, and sees outside forces attempt to destroy it. I will separate the ironic form (in which the pastoral world is destroyed, and the character emerges wiser and sadder to face the outside world), and the romantic pastoral (where the ideal pastoral setting is allowed to survive threats to its existence, and is by implication then safe forever). - Global Time: all times present and accessible in one moment, a mingling of past times with the present. - past and heritage: I will distinguish ‘past’ – a general term for events gone before, from ‘heritage’ – where these events are associated with a feeling of ‘owning’ them as one’s own personal history. - identity/sense of self: a secure and developed notion of one’s personal characteristics, a confidence in one’s place in the world in relation to other people. - belonging: a feeling of contentment and being ‘at home’ that is inherently tied to a place or group of people, but can be extended to a more abstract confidence of one’s ‘place in the world’. I anticipate three chapters, one each for a study of time, place and the pastoral form in the novels. Below is a brief, point form plan of each. (1)recovering continuity with past, recovering security & identity. - Theories of Global Time: philosophical versions, ‘God’s’ perspective of time. - Doubles as non-fantastic forerunners of Global Time. - Reflections as symbols of Global Time. Mirrors. Doubles. - Global Time establishes continuity of individual as a link in a temporal historical chain, restores sense of identity, belonging. This is a gentle process. - Important to belonging is a connection with a past unified and accessible. Global Time provides literal access to past. - talismans/time objects as conduits. - elderly people as conduits. - Concept of kairos (mythic time). Evoked by ritual (eg. story-telling) – another form of conduit. - Relationship of these time objects /conduits to identity/belonging: Connecting self to the past (here literally) through objects, elders. - Not everyone has access to Global Time: individuals need to be solitary, displaced, receptive, patient. When they do experience it, it is breathtakingly joyous and beautiful – the gentleness of the process is emphasised - identity formation here is not a violent process. - Blood connection or ‘being born’ at Green Knowe helps an individual to experience Global Time – but it is not essential. Receptiveness to the past and a love of antiquity is more important. (1) Green Knowe & gardens as a symbol & receptacle of past. - Context of time of writing: in WWII aftermath: buildings that were destroyed in England were not rebuilt as replicas (as in other countries) but as concrete blocks - the past was wiped out. - Green Knowe books partially as a response to loss of landscape, to changes modern progress was making to ancient rhythms of landscape and community. - Place holds traces and memories of all who have lived there – a wealth of kinship, history of identities to help define one’s own relative place. - Green Knowe as a symbol of continuity - the existence of the house as rescuing a past that was under threat. It is a boundary to the timelessness it encloses; a refuge, sanctuary. - Roger’s reaction to 20th century. (2)Place for the displaced, sanctuary. - The use of displaced children – physically and spiritually. These children come to Green Knowe and find there a home and sense of belonging. The most obviously displaced are Jacob, Ping, Oskar, Tolly, Hanno, but also Ida, Susan. Roger, Toby, Alexander and Linnet are different – secure in their place and identity, they have lived at Green Knowe since they were born. - Depiction of the response of the house to those who come to it – for each individual it becomes their own in a different way, providing them with what they need to see it as home, to make it their own. - House as refuge for wildlife. - Increasingly more threats to house arise over the series. Green Knowe is a catalyst for finding one’s sense of belonging and self, but what happens when the house is threatened with destruction? This will bring me to chapter three – pastoralism. (1) Series reworks it subtly but significantly. - What pastoral tradition involves. - Ironic pastoral form – ends with destruction of the pastoral world. - Romantic pastoral form – preserves state of innocence. - Nikolajeva: Odyssean, Oedipal, Promethean patterns in the pastoral form. - Arc of 6 books at first seems to follow pastoral conventions. - Children and Chimneys – integration into pastoral world. - Stranger and Enemy suggest increasingly greater threats. - Stones should culminate in house’s destruction, Tolly should emerge wider and sadder into adult world, but Boston instead allows it to survive the threats. - The pastoral world of Green Knowe during the series departs from pastoral tradition: There is death and anger in the world of Green Knowe. (2)Arguments that Green Knowe is not pastoral, or fits the ironic tradition. - Arguments that the world of Green Knowe is not pastoral. I disagree: threats to Green Knowe are always from the outside – not from within. - Arguments that the series does fit the ironic pastoral, that it finishes with a bitter acknowledgement that the pastoral world cannot survive. I disagree: within the scope of the books, enemies have not triumphed. Texts rather suggest that a deep experience of the past and the pastoral world, and the identity and sense of belonging developed through this experience, is internalised and no longer dependent on the pastoral world existing. Aers, Lesley. “The Treatment of Time in Four Children’s Books.” Children’s Literature in Education 2 (July 1970): 69-81. Boethius. The Consolations of Philosophy. Trans. VE Watts. London: Penguin Books, 1969. Boston, L.M. The Children of Green Knowe. London: Faber & Faber, 1954. — The Chimneys of Green Knowe. London: Faber & Faber, 1958. — The River at Green Knowe. London: Faber & Faber, 1959. — The Stranger at Green Knowe. London: Faber & Faber, 1961. — An Enemy at Green Knowe. London: Faber & Faber, 1964. — The Stones of Green Knowe. London: Bodley Head, 1976. — “A Message from Green Knowe.” The Cool Web: The Pattern of Children’s Reading. Ed. Margaret Meek, Aidan Warlow, and Griselda Barton. London: The Bodley Head, 1977. 216-220. Buckalew, Mary. “Global Time in Lucy Boston’s Green Knowe Novellas.” Children’s Literature Association Quarterly 19:4 (winter 1994-1995): 182-187. - A very detailed study of the use of Global Time, this article makes connections to philosophy and religion in an attempt to explain the notion..
Cameron, Eleanor. The Green and Burning Tree: On the Writing and Enjoyment of Children’s Books. Boston: Little Brown and Company, 1969. - A classic study, the chapter which gives the book its title examines Global Time, and links it to characters’ developing a sense of belonging. Written before the publication of Stones, it is interesting to note that many of her predictions hold true for Boston’s final novel. Eliade, Mircea. The Myth of the Eternal Return. Trans. Willard R Trask. New York NY: Pantheon Books, 1954. Eliade, Mircea. Myth and Reality. London: George Allen & Unwin, 1964. Hall, Linda. “The Pattern of Dead and Living: Lucy Boston and the Necessity of Continuity.” Children’s Literature in Education 29:4 (1998): 223-235. - A rare and useful investigation into the need for a sense of heritage in order to fully develop one’s own identity. Hollindale, Peter. “Timescape at Hemingford Grey: Lucy Boston’s Centenary.” Children’s Literature 22 (1984): 139-148. Krips, Valerie. “Presencing the Past.” Signal 90 (September 1999): 176-86. Kuznets, Lois R. “The Fresh-Air Kids, or Some Contemporary Versions of the Pastoral.” Children’s Literature 11 (1983): 156-170. Nikolajeva, Maria. From Mythic to Linear: Time in Children’s Literature. Lanham MD: The Scarecrow Press, 2000. - While providing a useful study of kairos or mythic time, this book has sections on the pastoral that are also very informative. Rees, David. Painted Desert, Green Shade: Essays on Contemporary Writers of Fiction for Children and Young Adults. Boston: The Horn Book Inc, 1984. Rosenthal, Lynne. “The Development of Consciousness in Lucy Boston’s The Children of Green Knowe” in Children’s Literature 8 (1980): 53-67. Scott, Carole. “A Century of Dislocated Time: Time Travel, Magic and the Search for the Self,”Papers: Explorations into Children’s Literature 6:2 (August 1996): 14-20. - Interestingly, Scott’s distinction between ‘early century’ and ‘late century’ fantasy specifically denies that the Green Knowe series involves any development of sense of self in its characters – the complete opposite to my contention. I will argue against her view. Smedman, M Sarah. “Springs of Hope: Recovery of Primordial Time in ‘Mythic’ Novels for Young Readers.” Children’s Literature 16 (1998): 91-107. Stott, Jon C. “From Here to Eternity: Aspects of the Pastoral in the Green Knowe Series.” Children’s Literature 11 (1983): 145-155. - The model for my study of the pastoral in Green Knowe, this article argues that Boston subtly rewrites the pastoral form. Townsend, John Rowe. A Sense of Story: Essays on Contemporary Writers for Children. London: Longman Group, 1971. I'd also be interested to learn more about how the pastoral (here in a very English guise) intersects with issues (anxieties?) of race... though maybe that's another project entirely. So, have you submitted this? I want to read it too! @Misrule - this was my Honours thesis proposal. I quickly found out my supervisor wasn't going to let me write what I wanted, so I quit. Wasn't willing to bastardise something I loved.